Fortuna Hjørring is a powerful club in Denmark women's football for a long time but now is trying to cope with the evolution of the sport in Europe, with big teams being built all across the Continent. But the Danish club can count on a renown academy and some state of the art infrastructure. Let us tell you their story. Northern Jutland is a part of Denmark that prides itself on great fishing opportunities, beautiful nature and a population that takes a generally very humble approach towards life. In an area which is not densely populated it is perhaps the most unlikely place to find a virtual football empire. Nevertheless in the midst of the rural idyll of Hjørring you may discover a Scandinavian football powerhouse in the face of Fortuna who since 1966 have left a strong mark on Danish and European football. The magnitude of their dominance has seen them record no less than nine Danish titles (winning their latest title last season) since they were formed while their finest hour in the European club competitions arrived in 2003 when they reached the final of the UEFA Women’s Cup. For years Fortuna Hjørring have been a dominant force in Scandinavian football but with new winds blowing in European football, the Jutland club are concerned to preserve their position at the top of the food chain in the North. At European level clubs like VFL Wolfsburg, Manchester City and Olympique Lyonnais have invested heavily in women’s football for several years and now Juventus and Manchester United have entered that race too – a race that is gathering pace. 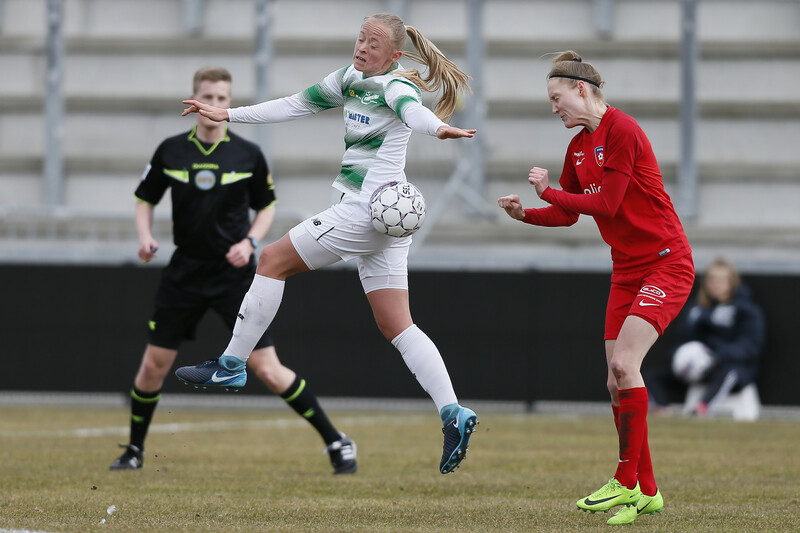 At the moment Denmark are guaranteed two spots in the UEFA Champions League but with European clubs increasing their interest in the women’s game, the Chairman of the Board at Fortuna Hjørring, Jette Andersen, is concerned. "It is of course positive that big clubs in Europe expand their interest in the women’s game. There is generally an increasing amount of focus on women’s football, more money is coming into the game but it also means we are facing bigger and bigger challenges", says Jette Andersen. One of the effects of the increased exposure of the women’s game is that it has become much harder for Fortuna to hang on to their best players and in the end of August this year Fortuna was forced to sell one of their biggest talents, the 19-year old Signe Bruun to Paris Saint Germain on a three-year contract. Player wages are also generally on the rise amongst European clubs and already three seasons ago Fortuna realized that their financial means did not stretch as far as luring a great number of foreign players to the club which has otherwise been the case in years before. "Today we have five foreigners in our squad for the 3F league while a couple of years ago, that number was twice as much", says assistant coach Peter Enevoldsen. "The average age in our squad has also gone down. When we faced Fiorentina in the Champions League this season they did not have any players under 26 years while we only had two players over 25. And certainly experience plays a big factor at that level", says Peter Enevoldsen. In order to be able to cope with the rising standards of the women's game, Fortuna identified their talent development program as the area where they could improve drastically. In order to find the right setup for the academy, the club was heavily inspired by the academy created by Danish champions FC Midtjylland in the Mens Superliga. The Fortuna academy was opened in August last year and today 17 youth players (Under-16, Under-18) as well as a large number of players from the 3F squad live at the academy while they attend a boarding school which organizes its lessons in accordance with their training sessions at Fortuna. In addition to the academy, the club also has a state-of-the-art artificial pitch and two huge indoor halls all built for their own money, money that largely comes from staging the World’s third largest youth tournament, "Dana Cup". 1100 teams from around 50 countries all over the world every year participates in the tournament which generates large sums of money which helps fund the club at elite level. "No question a lot of people are envious of our set up and I can imagine that many club executives and trainers in Denmark are frustrated that we have the means to attract players across the country to join us. But we have without a doubt the best facilities for women’s professional football in Denmark which will hopefully provide the foundation for being competitive... also at the highest level in Europe in the years to come" ends Jette Andersen.